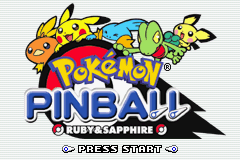 Released on the Game Boy Advance and years later on the Wii U Virtual Console, Pokémon Pinball: Ruby & Sapphire is the sequel of Pokémon Pinball on GBC, inheriting most of the previous game's mechanics with the addition of many fun and entertaining features. The goal of the game is to obtain all the 205 Pokémon and unlock them on the Hoenn Pokédex, while going through the two Pinball Boards featured in it, with their different areas and mechanics. Each of the Ruby Boards and the Sapphire Boards, has its own catchable Pokémon, bonus stages and field mechanics. Similarly to the precedent game, obtaining the Pokémon relies on activating certain mode on both boards, including the Catch 'Em Mode, the Egg Mode and the EVO Mode. Graphic wise, both game boards are fairly decorated and feature various animated Pokémon Bumpers that react to being hit by the ball. On the sound level, the game is still using a combination of soundtracks from the anime series and other Pokémon games. All the Pokémon from the Hoenn Pokédex can be obtained in the game (except for Deoxys), along with 4 extra Pokémon from the international Pokédex : Chikorita, Totodile, Cyndaquil and Aerodactyl, making a total of 205 obtainable Pokémon. 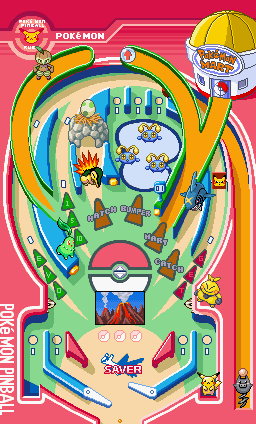 Many Pokémon are also featured on the game Boards, whether as Pokémon Bumpers or on the different Bonus Stages. Pokémon Bumpers: These Pokémon appear on both fields, replacing the classic Switches, Obstacles and Bumpers with each of them having a unique role. Some of the Pokémon Bumpers appear on both boards, while others are restricted to either the Ruby or the Sapphire board. Pikachu: It will rebound the ball using Thundershock and save it from falling, when it enters the bottom left or right exit lanes. After the gauge decorated with a thunder bolt icon is filled, the player can trigger Pikachu's location on the board, using one of the flipper buttons. Pichu: It has a similar function as Pikachu, since it also helps saving the ball from a certain fall. 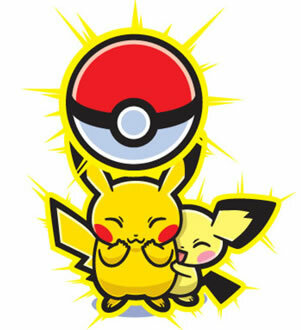 Pichu can be activated either from the Poké Mart or through slot, and it will be linked to the player's current ball. Losing the ball, will result in losing Pichu as well. Spoink: The launcher of the ball on both boards. Latios: It is available for a limited time to save the ball from falling. It can be obtained from the Poké Mart or the slot. Makuhita: It has different stances and appears in the middle right section of the board. If the player presses the right flipper when the ball is near Makuhita, which must be in attack stance, it will launch the ball to the loop where a Nuzleaf is located. Ball upgrades or even extra balls can be earned by hitting the Nuzleaf twice. Chikorita: Chikorita will pop up two Linoone with its Razor Leaf, when the button near it gets hit. Linoone: The two Linoone summoned by Chikorita each have a specific function. The right Linoone will change the battle stance of Makuhita, while the left one will summon a Gulpin. Gulpin: The travel mode is activated when three Gulpin appear. Sharpedo: It will activate the Catch 'em Mode, if two or more GET lights are shining. When the ball hits Sharpedo, it will swallow it and re-launch it. Cyndaquil: Each time it is hit, it will get knocked back a little, until it is knocked underneath the Egg. The heat from Cyndaquil's flame will then warm the egg and help it hatch, releasing a Pokémon the player can catch. Lotad or Chinchou: These serve as bumpers that help uncover the Pokémon Silhouette pieces once Catch 'Em Mode is activated. Three of them are present on the center top section of the board. 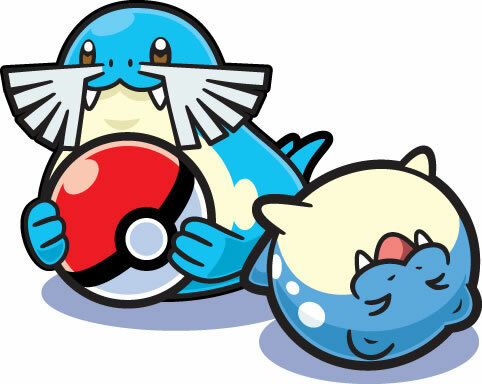 Whiscash: It sends the ball into the Spheal Bonus Stage when the ball is sent toward its mouth. It appears on the center top part of the field, replacing the three bumpers. If it is hit from the top part, it will get mad and cause the board to shake. Latias: Similarly to latios, it is available for a limited duration to save the ball from falling and give it back to Spoink. Zigzagoon: The slot will stop if the button near Zigzagoon is hit. Minun and Plusle: If the player hits both the Minun and Plusle buttons, the electric barrier blocking the way to the Poké Mart will disappear and it can be accessed to buy boosts. Seedot: Hitting the left button opposing Zigzagoon will make a Seedot appear in the basket. If the player manages to do so three times, the Travel Mode will be activated. Wailmer: If the player manages to light two or more GET lights and then sends the ball toward Wailmer, it will eat the ball and re-launch it, activating the Catch 'Em Mode. Shroomish: These are the counterpart of the Lotad and Chinchou from the Ruby Board, as they function as Bumpers for the Sapphire Board, helping unravel the different parts of the Pokémon Silhouette each time they get hit while Catch 'Em Mode is active. Pelipper: It will lift the ball to the Spheal Bonus Stage or simply place it on the top section of the board. 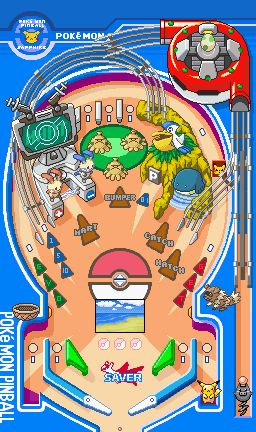 Most of the game features are inherited from Pokémon Pinball, with the addition of few ones like the Poké Mart and the Egg Mode. The Catch 'Em Mode : Once the player lights up two or more GET lights, by sending the ball where the GET arrows are pointing, they can activate the Catch 'Em Mode. This can be done by sending the ball into Sharpedo's mouth on the Ruby Board or Wailmer's mouth on the Sapphire Board. Once the mode is activated, a shadowed Pokémon silhouette will appear in the middle of the bottom screen. Hitting the Lotad/Chinchou Bumpers on the Ruby Board or the Shroomish Bumpers on the Sapphire Board will cause parts of the silhouette to gradually appear. Once the full silhouette is uncovered, it will turn into an actual Pokémon that the player can capture, by hitting it 3 times with the Poké Ball. Only one Pokémon can be caught at a time and there's a two minutes time limit to finish the whole process once, the shadowy silhouette appears. 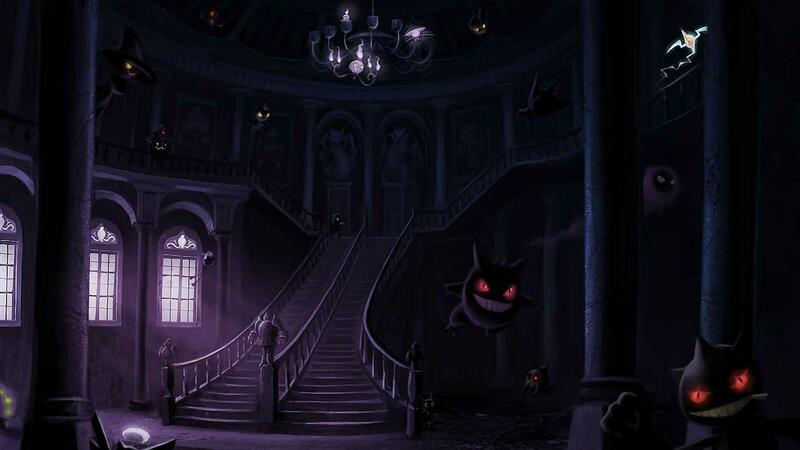 If the time runs out before the silhouette gets fully revealed or before the Pokémon is caught, both will disappear. The EVO Mode: This mode allows the player to evolve Pokémon they have already obtained. To activated the EVO Mode the player will first have to light up three EVO lights, by sending the ball where the EVO arrows are pointing. Then, the ball must be shot where the EVO Start arrow is pointing. The player can then select which Pokémon they want to evolve. With that done, the EVO Mode will start and items corresponding to the Pokémon's evolution type will spawn on the field. The player will have to collect three of these items then send the ball into the vortex that will appear in the middle, to complete the evolution. If the Pokémon evolves through reaching a certain level, exp tokens will spawn on the field. 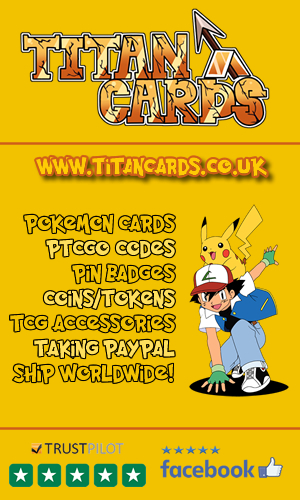 If it evolves through trade, Link Cable tokens will spawn instead. If its evolution is normally done with the use of an evolution stone, the respective stone will spawn around the field. Similarly to the Catch 'Em Mode, only one Pokémon can be evolved at a time and there's a two minutes time limit to finish the whole process, once the Pokémon the player wants to evolve is selected. Egg Mode: It is the new way of obtaining Pokémon, introduced in Pokémon Pinball: Ruby & Sapphire. 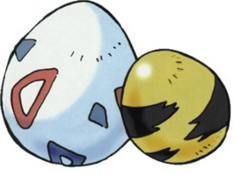 During this mode the player has basically to make a Pokémon Egg appear and then hatch it, releasing a Pokémon they can then hit with the ball to catch. Spawning the Pokémon Egg requires different methods for each board. On the Ruby Board, the player will have to shoot the ball under the nest. Doing so will cause a Totodile to appear carrying the Egg and putting in into the nest, or an Aerodactyl will carry it and drop it in the nest. After that, a Cyndaquil will appear blocking the path of the ball the nest. Each time the player hits the Cyndaquil, it will be pushed back, until it is finally placed underneath the nest, after three hits. The flames on the Cyndaquil's back will heat up the Egg and cause it to hatch. On the Sapphire Board, the player has to send the ball into the Egg Incubator to make it appear. Then they have to repeat the same actions three more times, which will result in the Egg hatching. Once the Egg hatches, a Pokémon will get out of it and starts moving around the board. To capture it, the player has to hit it two times with the ball, with a time limit of one minute. Furthermore, some Pokémon have a different way of being caught, that doesn't match any of the methods mentioned above. Rayquaza, Groudon and Kyogre can only be caught after their respective Bonus Stages are completed twice in the same game. Jirachi too, being considered the rarest Pokémon of the game, can only be caught after matching the Jirachi Bonus on the slot, while in the Ruins Area. To make it even harder, Jirachi will be moving around the board and has to be hit three times to be caught. There are three Poké Balls displayed on the board, just above the Latios/Latias saver image. Every time the player catches a Pokémon, one of the Poké Balls will light up, while evolving a Pokémon will get two of them lit. Once the player lights up all the three, Poké Balls, a vortex will appear and will take the player to a bonus stage if the ball enters it. Completing a Bonus Stage, will unlock the next one on the board, as they work in a linear way, with the final stage being Rayquaza Bonus Stage on both the Ruby and the Sapphire Boards. The Kecleon and Groudon Bonus Stages are exclusive to the Ruby Board, while the Dusclops and Kyogre Bonus Stages are exclusive to the Sapphire Board. An additional bonus stage, the Sealeo Bonus Stage, can be accessed on both boards and doesn't require the same conditions as the rest of the stages. 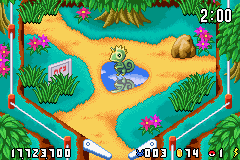 Kecleon Bonus Stage: The first bonus stage on the Ruby Board, with a one minute time limit, where the player has to hit a Kecleon that can turn invisible ten times with the ball. If it turns invisible, Kecleon will hide in tall grass and can only be shown again after the player knocks a Devon Scope down from the tree in the middle top part of the screen. Clearing the stage will earn the player 30 million points of bonus, if they have a standard ball. The bonus will be multiplied depending on the type of ball the player has. Groudon Bonus Stage : It is the second bonus stage on the Ruby Board, with a three minutes time limits. Groudon will be facing the player at the top of the screen throwing fire balls at the Poké Ball to change its trajectory, spawning rocks on the field as obstacles and causing an eruption which creates four fire pillars around him. 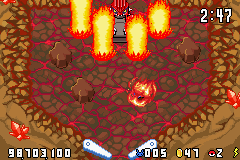 To break a rock the player has to hit it three times, while the fire pillars will take four hits each to vanish. The player will then have to get rid of the obstacles in the way and manage to hit Groudon 15 times in order to complete the stage. When the player clears the stage, they receive a bonus of 50 million points, which also gets multiplied depending on the ball used. 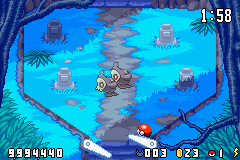 Dusclops Bonus Stage: The first stage of the Sapphire Board, where up to two Duskull appear at a time, in an abandoned graveyard. The player needs to hit 20 Duskull to spawn Dusclops, who'll be moving toward and away from the flippers. The Poké Ball must hit Dusclops five times from behind to complete the stage, as he devours it if it hits him from the front, and throws it toward the space in between the flippers. Clearing the stage will earn the player 30 million bonus points which will be multiplied depending on the ball type. Kyogre Bonus Stage: It is the second stage of the Sapphire Board, with a time limit of three minutes. Kyogre will be freezing the ball and creating whilpools to hinder its movements. It will also dive underneath the water and then rise up again. Air bubbles will show at the surface of the water, indicating the place where Kyogre will resurface. 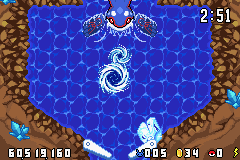 The player has to avoid the obstacles and hit Kyogre 15 times to complete the stage. Once the stage is complete, a reward of 50 million bonus points is added to the player and it can be multiplied depending on the ball they're using. Rayquaza Bonus Stage: It is the third and final stage on both boards. 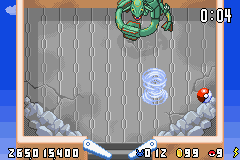 Here, the player has to hit Rayquaza 15 times to complete the stage, while Rayquaza tries to avoid the ball by bouncing and let it pass beneath it, or sometimes attacking the ball with thunder paralyzing its movements. Rayquaza will also create up to two tornadoes around the field that will send the ball flying for few seconds, if it hits them. Completing this final bonus stage will reset the bonus stages cycle to the first stage on the board and earn the player a tremendous reward of 99,999,999 bonus points, multiplied by the ball type multipliers. The Sealeo Bonus Stage: It is a bonus stage that can be accessed any time on both fields, without any requirements. 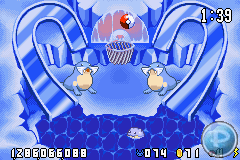 The player has simply to throw the ball into Whiscash's mouth on the Ruby Board, or hit the Pelipper bottom and let the ball fall into its mouth in the Sapphire Board. This will result in the ball being transported to the Sealeo Bonus S tage. In this bonus stage, there are two ice slides on right and left sides of the field. The player has to slide the ball up one of the slides to one of the two sealeo which will throw the ball into the Basketball Hoop. Sometimes, a Spheal will be trying to climb one of the slides, allowing the player to hit it from behind with the ball and get thrown by the Sealeo into the Basketball Hoop too. The player's goal here is to get as many Spheals and Poké Balls as possible, through the Basketball Hoop, within a time limit of 2 minutes. Each Ball scored will earn the player 1 million bonus points, while each Spheal will earn them 5 million bonus points. There are three lights on the top section of the board, that will upgrade the Poké Ball, if they get are lit at the same time. The ball will transform into a Great Ball, then into an Ultra Ball and finally into a Master Ball, with each transformation multiplying the points earned on the board and from the secret stages respectively, 2x, 3x and 4x. Similarly to the precedent game, some Pokémon are only available on certain locations on each board, which requires the player to move in between these locations in order to capture all the Pokémon. To do so the player has to hit certain bumpers, that will trigger a change in locations. Petalburg Forest, Chimney Mountain, Plains, Lilycove, Safari Zone, Granite Cave and Ruins. Petalburg Forest, Lake, Plains, Beach, Desert, Granite Cave and Ruins. Sticker style sprites of Pichu, Pikachu, Pelipper, Spoink and Makuhita from the games intro. Saver For the duration of 30, 60 or 90 seconds, a Latios/Latias will be on standby waiting to save the ball, if it falls, returning it to Spoint to re-launch it. It is the new Shop feature, where the player can spend the coins they earned by sending the ball through the coin loop, to buy boosts. Check out these Pokemon Pinball: Ruby & Sapphire videos including TV Commercials, trailers and the games intro. Pokémon Pinball: Ruby & Sapphire is the first Pokémon Game to be released on the Wii U Virtual Console. The game music changes when the player clears the Rayquaza Bonus Stage. The game can be played on Nintendo Game Cube with the help of the Game Boy Player accessory. This allows the use of the Rumble feature of the Game Cube controller, making the controller shake when Whiscash causes the screen the shake. The more simplistic International Logo (left) vs. The cuter, more colourful Japanese Logo (right). Within three weeks of its release, Pokémon Pinball: Ruby & Sapphire sold around 158 thousand copies in Japan only. The sales increased slowly as the game sold a total of 440 thousand copies in Japan, nearly 380 thousand in Europe and 680 thousand copies in North America, with a global final number of 1.56 million copies sold. Craig Harris from IGN enjoyed this sequel stating "There are plenty of pinball games to choose from on the Game Boy Advance. But as good as those games go, Pokemon Pinball tops", while giving the game a score of 8.8/10, the equivalent of "Great" on the IGN scale. Jeff Gerstmann from GameSpot also liked the game mechanics, rating it 7.3/10, which equates "Good" on the GS scale. 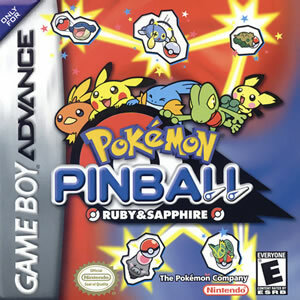 On GameRankings, Pokémon Pinball: Ruby & Sapphire received a fairly high score of 80.03%, over 27 reviews, while it scored 81% on Metacritic, over 22 critics. Box Art from Pokemon Pinball: Ruby & Sapphire including several different regional variations and editions.